With most of Europe in the grip of winter, January seems a good time to put together a new touring route for Portugal’s Algarve region – which provides some of the best opportunities for cycling anywhere on the continent at this time of year. Look carefully at a map and you can see how far down the Algarve lies. The region’s main city, Faro, is only about half a degree further north than the capital of Tunisia. Blue skies and blazing sunshine, spiky agave plants and prickly pear cactus… it’s easy to see how the far south of Portugal has more in common with North Africa than Northern Europe. The beaches are what attract huge numbers of people here in the summer months. However, this is definitely not the best time of year for cycling – daytime temperatures can peak at over 40°C (105°F), accommodation is at a premium and there’s way too much traffic on coastal roads to make for pleasant riding. By contrast, the winter can be much more pleasant. Although the weather is not so predictable, clear blue skies and warm sunshine are much more common than the grey skies and chill of further north. Daytime temperatures are often in the high teens (+60°F) even in January. And, there’s a whole lot of attractions for cyclists here in the ‘off season’. For one thing, with 95% of those other tourists gone, everywhere is extremely quiet, meaning far less traffic on the roads – and some good deals to be had on accommodation. Plus, the scenery is magnificent. The main tourist beaches are pretty enough (even if some of the sprawling development around them can be an eyesore). Head further west beyond Lagos and south coast’s cliffs and coves are gorgeous – and almost empty in the winter. The coast north of Cabo São Vicente – mainland Europe’s most south-westerly point – is even better. It’s hard to access but the beaches here are wild and completely unspoilt. The inland Algarve, though, will be the main attraction for most cyclists. 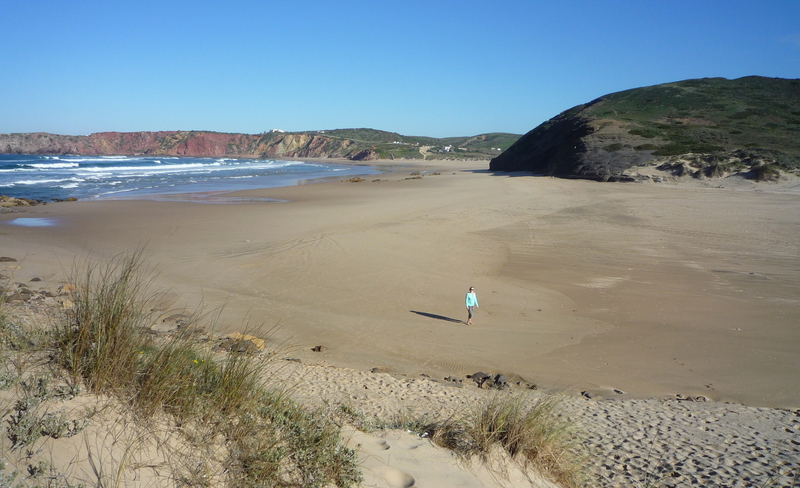 Head 10-20km in from the coast and you’re in a totally different world to that of tourist resorts like Albufeira. Small back roads take you past miles of orange groves, small villages, vineyards, scruffy farms, hillsides covered with olive trees, cork oaks, cistus bushes and eucalyptus. The landscape also gets much more rugged as you head inland – the hills north of Loulé are the scene of February’s Volta ao Algarve, which many top competitive cyclists use as a warm-up event for the big races later in the year. Anyway, I could go on extolling the virtues of the Algarve as a winter cycling destination but the best way to find out is to try it for yourself. The new touring route I’ve put together provides a circuit of the western half of the Algarve, linking many of its most historic towns, some of the resorts, plus the wild beaches of the west coast and the mountains around Monchique. It’s not an easy ride – there are some big hills to climb – and it does involve roads where you might want something a bit more rugged than a lean, mean racing machine. I’ve already ridden a large part of the route and have been working with Algarve resident and fellow cyclist Andy Smallwood, who knows many of these roads way better than me. I’m also down here in the Algarve at the moment and – thanks to a couple of bikes supplied by bike hire specialists Cycling Rentals – I’ll be checking out some extra rides over the next couple of weeks. Thanks for the feedback! Looking forward to visiting Porto, Lisbon and the Algarve. Keep up the great work! Enjoyed your article. Not sure exactly when we’ll be travelling to Portugal – definitely within a couple of years. Would love to spend a week or two in the Algarve region. We have a tandem (an early 90’s Arriva Santana), but are considering renting a tandem over there to do day trips. I wouldn’t bank on hiring a tandem in Portugal – they are very rare beasts! You can hire tandems in the Algarve but the ones I have seen are basic ‘fun’ bikes not for serious riding. Cycling Rentals (national firm) did have a tandem but have currently withdrawn it – I think they’re hoping to replace it with a higher-spec machine. Renting solo bikes is much easier, particularly in the Algarve but you tend to get what you pay for (cheap for basic bikes, a bit more expensive for a decent ride).